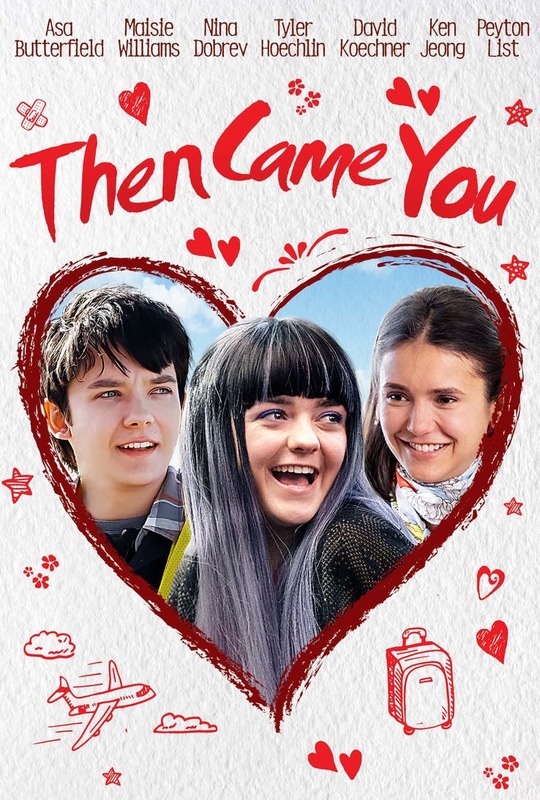 The poster for director Peter Hutchings’ comedy-drama, ‘Then Came You,’ which stars Asa Butterfield, Maisie Williams and Nina Dobrev. Sometimes the most important lesson that people can learn is that it’s not how long they live, but how they live the life they have, that truly matters. That’s certainly the case for the two main protagonists in the upcoming adventure film, ‘Then Came You.’ The comedy-drama touchingly emphasizes the fact that people must learn to move past their fears in order to obtain happiness. That important message is highlighted through the story of the two young main characters, who end up teaching each other that they have to not only accept, but also value, the situations they’re in, in order to become truly content. Peter Hutchings directed ‘Then Came You,’ which was written by Fergal Rock. Shout! Studios is set to release the movie this Friday, February 1, in theaters and On Demand. ‘Then Came You’ follows Calvin Lewis (Asa Butterfield), a 19-year old airport baggage handler who’s struggling to cope with his hypochondria. He’s leading a routine life of working with his father, Bob (David Koechner), and older brother, Frank (Tyler Hoechlin), at the airport, and attending numerous doctor’s appointments, during which the physicians continuously pacify his worries over his false alarms of sickness. While Calvin has a seemingly happy family life, he’s still carrying remorse about losing his twin sister in a critical car accident many years ago. His mother, Ellen (Ann Osmond), is also still suffering from her own guilt, primarily because she was driving at the time of the crash, which caused her young daughter to die. Despite the troubles within himself and his family, Calvin surprisingly begins to find comfort at one of his cancer support meetings, even though his doctors have assured him that he doesn’t have the disease. He begins to pond with fellow teen Skye Aitken (Maisie Williams). The outgoing Skye is intrigued by the introverted Calvin, who brushes her off to head to work. But she still determinedly tracks him down at the airport. She informs him that helping someone like him is on her bucket list before she dies, so she enlists him to help her complete the tasks. Soon, Skye learns that Calvin is romantically interested in flight attendant Izzy (Nina Dobrev), who the duo feels is out of his league. But Izzy actually admits that she’s interested in getting to know Calvin better. As Calvin and Skye become more comfortable and familiar with each other as supportive friends, they set out to help each other find true happiness and achieve their goals, including him asking Izzy out on a date and overcoming his physical and emotional ailments. They help each other learn to confront and conquer their fears and become happier in their life situations. Hutchings generously took the time recently to talk about directing ‘Then Came You’ during an exclusive phone interview. Among other things, the filmmaker discussed that he was interested in helming the comedy-drama because he immediately fell in love with the characters and the journey they go on together during the first time he read Rock’s screenplay. He also noted that he cast Williams and Butterfield because they not only naturally complemented each other, but they also truly understood the importance of balancing the humorous and serious moments of the story.